ADATA expands its industrial flash storage line up with the addition of the IM2S3338 and IM2S3334 industrial-grade M.2 solid state drives. The compact M.2 form factor offers better flexibility and versatility to address different applications. The IM2S3338 is available in an M.2 2280 form factor using TLC flash while the IM2S3334 goes in the smaller M.2 2242 form factor and available in TLC and MLC variants. Both offers performance of up to 560MB/s read and 525MB/s write. 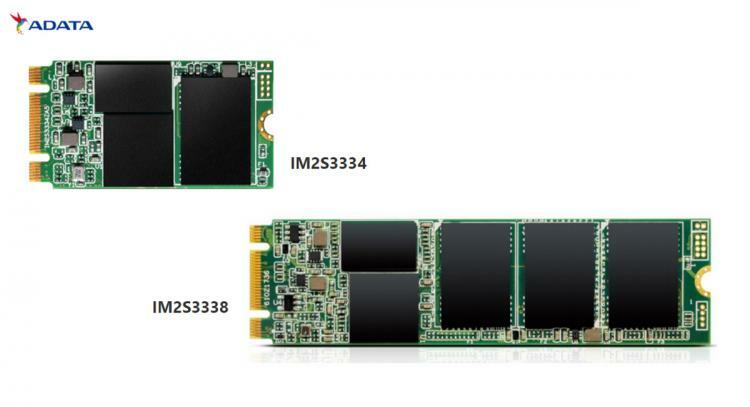 With the IM2S3338 and IM2S3334 offered in two M.2 form factors and available in capacities from 128GB to 1TB, ADATA offers a comprehensive range to choose from to address different applications. With Industrial-grade specifications, the IM2S3334 3D MLC is rated for an extreme -40 to 90 degrees Celsius, while the IM2S3338 can operate in 0 to 70 degrees. Both are certified for 5 to 95 percent relative humidity, 20G vibration resistance, and 1500G/0.5ms shock endurance. The IM2S3338 and IM2S3334 support S.M.A.R.T diagnostics, wear levelling, EMI protection, and low density parity check error correction in boost longevity. They also provide power fail protection and recovery through on-board capacitor reserves, secure erase for extra confidentiality, and TRIM command for smarter capacity utilization.